Unlike other systems, Shareable Apps go live as soon as you hit “publish” so you can start reaching your audience immediately. Here are a few simple steps to getting your app onto their devices. Every Shareable App contains a ‘share panel’ accessible from the top right menu. This allows users to share it instantly with their friends, family and colleagues via SMS, email and social media. Below is a live demo of a Shareable App! 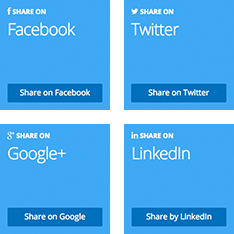 Click the icon to open the share panel and share it with yourself. Once you have published your app, click the Share button to view the Share dashboard. Here you can send a link to the app via SMS, email, social media, QR code and Web Widget. 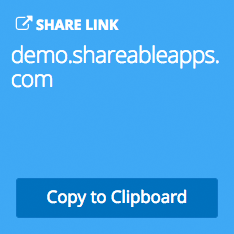 Click the ‘Copy to Clipboard’ button to copy the installer link. Paste this into your emails, webpages or Word documents to send people to your app’s install page. 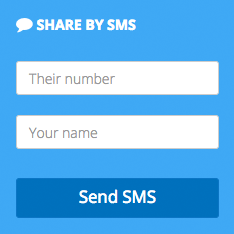 Enter a mobile phone number and your name to SMS a link to install the app. Every Shareable App comes with 75 free SMSs. You can purchase more from your dashboard to ensure uninterrupted sharing by SMS. Enter an email address and your name to email a link to install the app. Click on the social media buttons to post a link to your app on your social media pages. Click the ‘Get embed code’ button to copy the code to your clipboard. Paste this into your webpage’s code to promote a link to install the app right from your website. 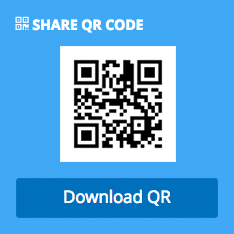 Click ‘Download QR’ to save an image of the QR code to your computer. Use it in print marketing to allow users to scan it with a barcode app, which will then redirect them to your app’s install page. SMS or email your customer database with an install campaign to drive adoption of your app. Then follow up with exclusive offers, news, features etc to keep them engaged. We can manage this for you and provide a suite of analytics too. For more information and pricing contact the Shareable Apps team. Send an email newsletter to your subscribers to promote your Shareable App. Include an email widget or link to the app’s install page or use keyword response (see below) to drive adoption of your app. An SMS with a link to your install page is the most efficient way of getting the app onto your customers’ mobile devices. Keyword response marketing typically looks something like “Text KEYWORD to NUMBER to get our Shareable App”. And you can run a keyword response campaign across TV, radio or print. Please contact the Shareable Apps team for more information and pricing. All sharing methods via the app and the dashboard are absolutely free, including 75 SMS shares. Additional SMSs are very reasonably priced in packs. SMSs can be sent one-to-one via the app and dashboard. SMS Blasts can also be used to send the app link to a large group of people. You should purchase an SMS Pack before doing any mass marketing i.e. email campaigns, social media, web widget etc. Users who tap the link on their smartphone can install your app directly, but those who click the link on their desktop have the option to get the link texted to them, which will count towards your SMS quota. Accessing the Shareable App via a smartphone does not incur an SMS cost since the app is downloaded directly to the device. Always make sure you’ve purchased enough SMSs per app to allow the app to be shared successfully. To set up an SMS Blast and/or purchase an SMS Pack for your next marketing campaign, please contact the Shareable Apps team for more information and pricing.